When I do a review of a product, it has to be something I'm interested in and something that will be applicable to the whole family. Good ice cream certainly fits into these two categories. Even though my blog is mainly about healthy alternatives for lunches, sometimes a family needs a great dessert as a treat. 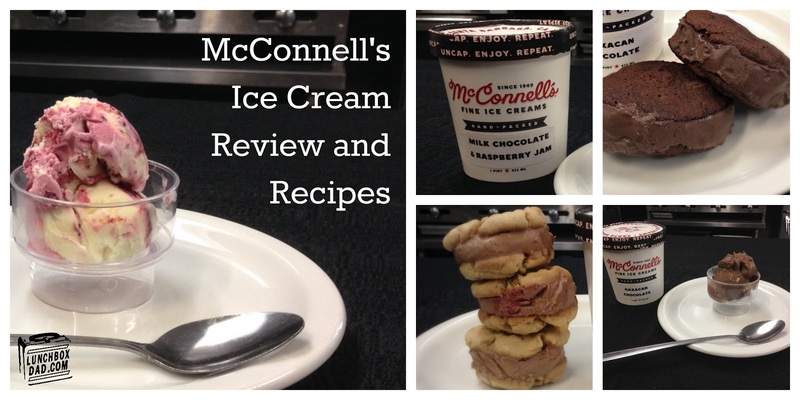 When McConnell's Fine Ice Cream approached me about reviewing their new flavors, I couldn't resist. In fact, our family and friends couldn't resist either! We invited a number of them over to taste all the interesting flavors. Before I tell you my take on McConnell's new flavors you need to know a bit about the company. McConnell's is a family owned dairy in Santa Barbara, California. They actually make their own ice cream base from scratch, which many ice cream companies don't do. They use local raw milk and organic cage free eggs. In fact all of their ingredients are all-natural sustainable and organic! There are no no stabilizers, fillers, or additives. Even all of their jams, caramels, chocolates, etc. are housemade. Their use of all-natural ingredients is one of the reasons I was interested in their ice cream in the first place. They also use their one of a kind ice cream machine to stir and freeze their products. 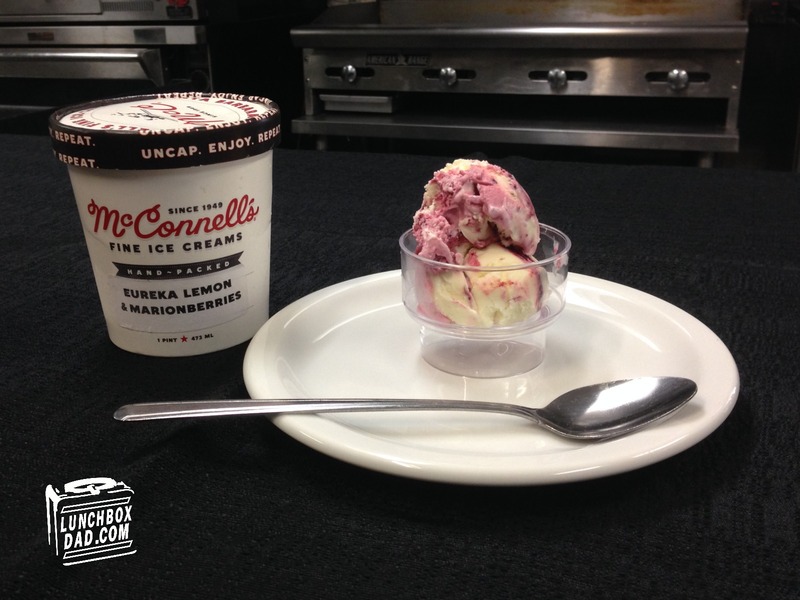 So before even tasting their ice cream, it was evident that they took great pride in their ingredients and recipes. I could tell in the creaminess and texture that this was going to be a different sort of dessert than I am used to. With that said, all of the above doesn't matter if the taste of the ice cream is not appealing to kids or adults. I was given the opportunity to taste these flavors: Eureka Lemon and Marionberry, Oaxacan Chocolate, and Milk Chocolate and Raspberry Jam. 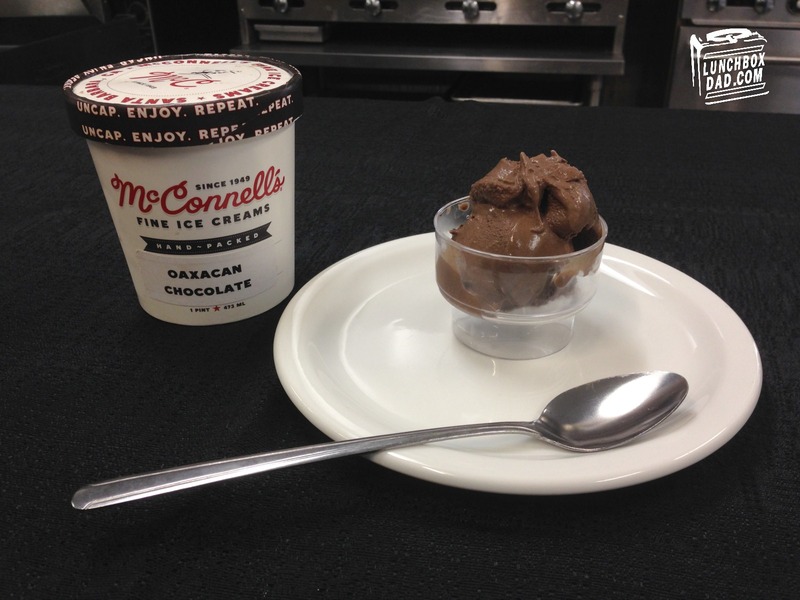 McConnell's also carries other fun and different flavors such as Olive Oil and Salted Almond, Churros Con Leche, and Dark Chocolate Orange. Here is my review of the three flavors along with some of the opinions of my family and friends. This was the all around favorite by most people including myself. If you like intense, fruity flavors then you will love this. It is bright and refreshing. The lemon flavor is tangy but doesn't overpower the rest of the flavors. Kids and adults alike loved this. When I took the ice cream to work to take pictures, my wife told me I better bring this flavor back home! This one took some getting used to for me. Since it is a dark chocolate, I expected a bitterness to it. There was no bitterness but I was surprised at all the different nuances this ice cream has. There is a cinnamon undertone with a hint of a chili pepper finish. I know this sounds strange, but it is what good Oaxacan chocolate is supposed to taste like. I felt the flavors worked very well together and this was my second favorite overall. Some of my friends really liked this as well, but the kids were not impressed. This is definitely more of an adult flavor. This was the kid's second favorite flavor. This duo of chocolate and jam is good, however I felt it needed a little something salty to go with the sweet. When I paired it with homemade peanut butter cookies, they added the saltiness that I wanted and made the taste almost like a chocolate PB&J sandwich! It is very good with or without, but I preferred this flavor paired with the saltiness of peanut butter. 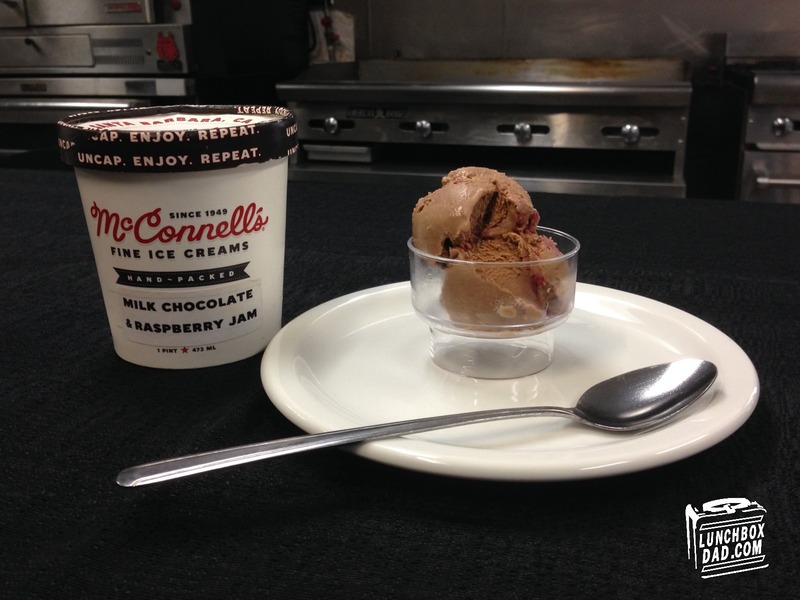 You can find out more about McConnell's Fine Ice Cream, and also where to locate it in your area, by going to their website at www.mcconnells.com or on Facebook HERE. 1. Start with your favorite all natural Chocolate Chocolate Chip cookies. Since McConnell's ice cream is all natural, you don't want to ruin that by using cookies with artificial ingredients. You will need two cookies per sandwich. 2. 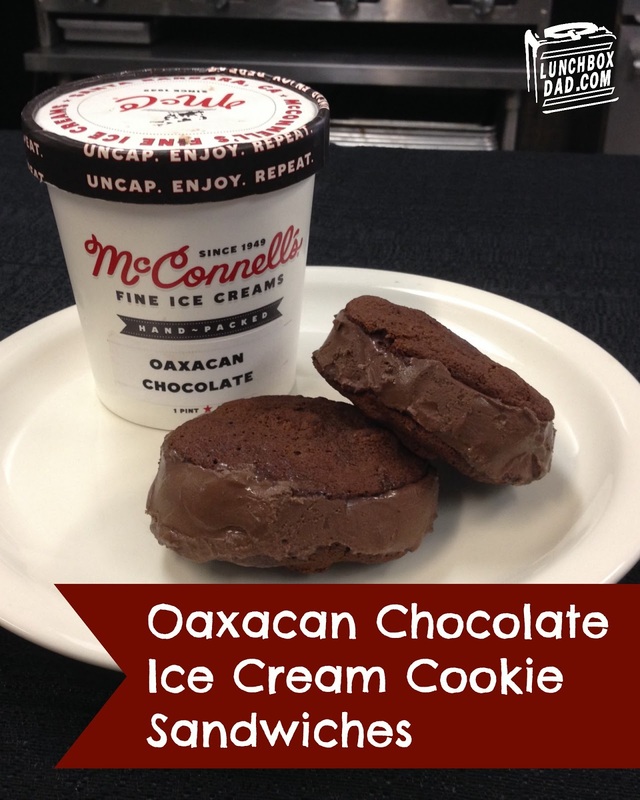 Spoon out a small amount of McConnell's Oaxacan Chocolate Ice Cream onto one cookie. A little goes a long way so you will want to use it sparingly. 3. Place the second cookie on top and push down lightly until the ice cream reaches the sides of the cookie all the way around. Use a knife to even up the look of the ice cream if desired. 4. Wrap in wax paper and put back into the freezer if not serving immediately. 1. Start with your favorite all natural peanut butter cookies. Since McConnell's ice cream is all natural, you don't want to ruin that by using cookies with artificial ingredients. You will need two cookies per sandwich. I made my own peanut butter cookies using all-natural peanut butter. Softer cookies are better. 2. 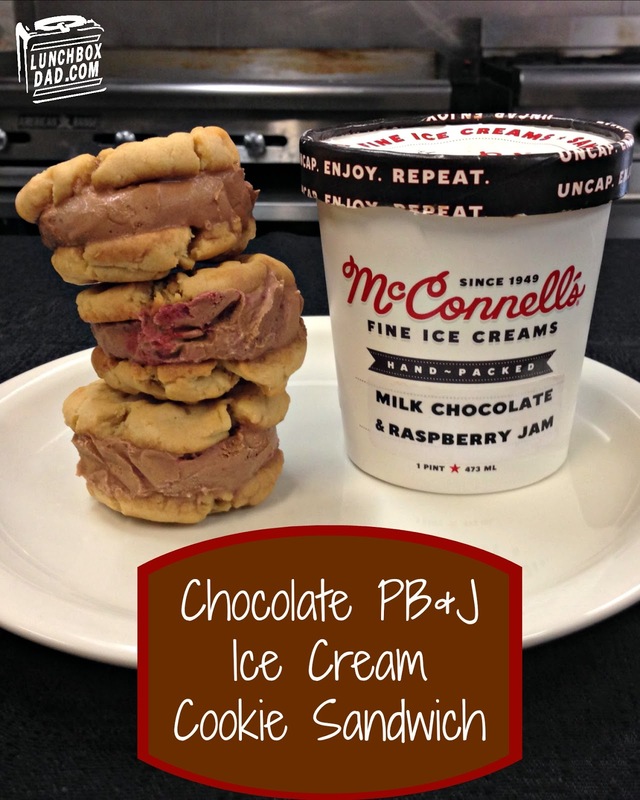 Spoon out a small amount of McConnell's Milk Chocolate and Raspberry Jam Ice Cream onto one cookie. A little goes a long way so you will want to use it sparingly. Disclosure: McConnell's Fine Ice Cream sent me this product to review. I have received no other compensation for this post and the opinions I’m expressing here are solely my own. I shouldn't have read this because now I am jonesing for some ice cream. I don't know if you can get this up in Canada but its some pretty good stuff! But can't you just make some ice cream out of all the snow or something up there? Ha! So I was reading an email from a friend from Canada at the same time I replied. Teach me to try and multitask! Yes, driving would probably be closer for you!